Despite the second weekend of Black Panther taking place this frame, other studios are still releasing movies. I mean, sure, go ahead if you must. Game Night is the latest of the “surburbia gone wild!” comedies appealing to 20 to 40 somethings that have had varying success – from We're The Millers to Rough Night, Date Night to Hall Pass, these can work very effectively or wither on the vine if handled lamely. This looks to be one of the better versions, with a solid cast and premise and, get this, actual jokes in the trailer. Jason Bateman and Rachel McAdams play a couple who host a weekly couples game night, which is jazzed up by Bateman's brother (Kyle Chandler) who proposes an ultra-realistic, no-really-it's-all-part-of-it murder mystery night, only to be kidnapped in the middle of it. Or was he? It's hard to tell, since that's exactly the kind of double fake-out you'd expect him to pull! And thus, they head out into the city to solve the mystery, or “mystery”, as the case may be for a series of Adventures in Babysitting/The Game style hijinks, albeit with potentially deadly consequences. Or who knows, because... oh all right, I'll stop. Loosely riffing on the entire oeuvre of David Fincher, it's a fun-looking mind twist of a comedy, which at least distinguishes it from all the other variations on this idea. Reviews are strong and distinguish itself from directors John Francis Daley and Jonathan Goldstein's last, Vacation. Bateman's been a solid if not bulletproof earner in the last ten years or so in a strange career renaissance, with McAdams adding a bit of spice though she's never really proven to be a box office draw. I think we should see this open with a solid $23 million. 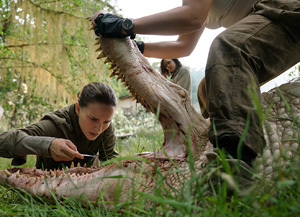 A curiously low-key sci-fi thriller, Annihilation stars Natalie Portman in an adaptation of a best-selling book series about an expedition into a strange anomaly called The Shimmer, which has resisted all previous attempts to classify and identify it, and killed or otherwise maimed all those that have entered into it before. Portman joins the team in order to help collect anything that might help her husband (Oscar Isaac) survive after he returns grievously ill from the previous expedition. Jennifer Jason Leigh, Tessa Thompson, Gina Rodriguez and Benedict Wong round out the notable names of the cast, with director Alex Garland bringing his “low” budget wizardry to a sci-fi film that looks like it costs about three times as much as it did. The visuals are pretty spectacular, from the soap bubbly effect used for the shimmer, to the creatures found within, although the plot potentially looks a bit thin. Reviews are strong though, and Garland has a lot of cachet built up from Ex Machina. The film is still taking a less than ultra wide opening strategy though, and in just 2,000 or so venues should open to about $12 million. Teen romance Every Day has a killer hook – a teen, played by Angourie Rice falls for another teen who just happens to inhabit another person's body every single day. Always around the same age, always nearby, and never the same person twice. It makes relationships... a challenge, but makes for a nice parable about finding the good in everyone. Basically The Time Traveller's Wife for the YA set, it's a nice bit of trifle, but will struggle to break out of the demographic and open to about $6 million. What more is to be said about Black Panther? The sort-of-out-of-nowhere fifth biggest opener of all time and which smashed the February record was a true sensation, with $202 million, $242 million over the President's Day holiday weekend. The highest grossing film by a black director and with a primarily black cast, and gathering plaudits along the way for being one of the most complex Marvel films to date. Only three films have managed a $100 million second weekend, and Black Panther can threaten this group, with its strong word of mouth. I would look for this to come in with around $105 million for its second bow. We likely say goodbye to one of the craziest phenomena of 2017 this weekend, as Jumanji: Welcome to the Jungle will spend its last weekend over $5 million. There's still a play at $400 million for the film, but it's going to have to trickle its way to that.